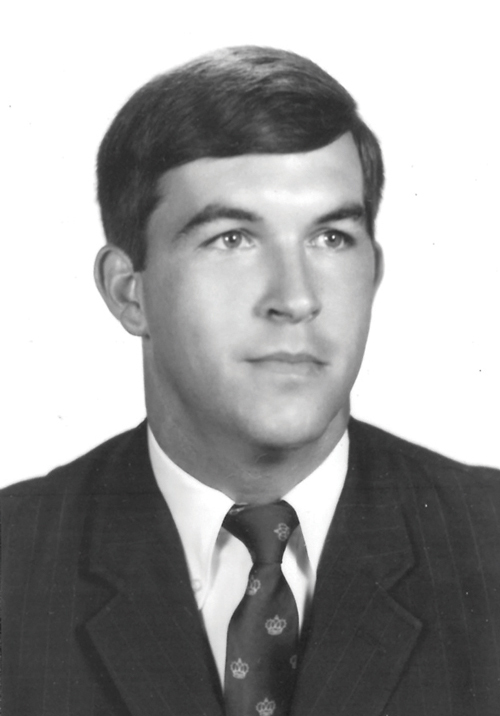 Jordan’s class portrait form the University of Georgia, where he earned a political science degree in 1967. Hamilton Jordan led Jimmy Carter’s 1970 gubernatorial campaign and his 1976 presidential campaign before becoming chief of staff in 1979. He died in 2008. It was already hot enough that summer of 1961, but the temperature went up all over town when the civil rights struggle came to Aw-ben-ny. Dr. William Anderson, an idealistic black physician, organized the Albany Movement to test the city’s willingness to integrate public facilities. The organization’s actions were aimed specifically at eliminating the “White Only” signs at bathrooms and water fountains—the most power­ful symbol of legal segregation throughout the South—and to give black Georgians access to the local bus system and trains. Unfortunately, the good intentions of Anderson were not enough. While Anderson had energized the black community, he had no plan for translating their activism into leverage with the white authorities. After several months of public marches and the subsequent arrests, trials, and releases, there was little evidence of legitimate progress. The word on the street was that the movement was floundering, losing steam, and having trouble finding fresh marchers, since many locals could not afford more time in jail or fines. In addition, there was a growing sense of competition between locals and outsiders for leadership of the Albany Movement. The leadership of the Student Nonviolent Coordinating Committee (SNCC), which had sent key national leaders into Albany, was increasingly concerned that other civil rights organizations might be invited in. While the movement dominated the headlines and gripped the local community, nothing was really happening: There was no dialogue with the public officials and no strategy. The white community, in the meantime, smugly “stiffed” Anderson, refusing to even talk to him or his lieutenants. By strictly enforcing the law and never resorting to highly publicized violence (as Chief Bull Connor would later commit in Birmingham), the white establishment in Albany made its strategy obvious: They simply planned to wear the Albany Movement down. Flustered and uncertain as to how to play his hand, Anderson finally turned to his old Morehouse classmate Martin Luther King Jr. and asked him to come to Albany for a speech. King—who was still developing the nonviolent tactics that would later prove so successful—accepted the invitation for a single appearance simply as a favor for an old friend. However, once King arrived in Albany and made a powerful and moving speech at Mt. Shiloh Baptist Church, he immediately realized that he had invested his personal reputation in the Albany Movement. What had been a local and state story became a major national news item overnight. At the age of 17, during the following winter, I saw King’s first march in Albany. Despite pleas in the Albany Herald for its white readers to refrain from glorifying these “trouble-makers and outside agitators,” my father surprised me by inviting me to go downtown with him one Saturday morning to witness King’s first march. I was fairly certain, though, that we were going in the spirit of curiosity—not support. In just the few minutes it took to get there from our home, we found ourselves standing in the middle of the all-white crowd, two or three deep along both sides of Pine Avenue. It was December, and the day was cold and overcast. An eerie silence pervaded the downtown area because most stores and offices were closed and the major streets roped off. After so many months of public demonstrations, a ritual had developed among the marchers and the police: The marchers would gather at one of the large black churches for coffee and doughnuts, speaking and singing and seeking inspiration from one of the gifted preachers from around the South recruiting worshipers to join in the march. The crowd would then pour into the street, a flood of black faces, accentuated by the occasional white priest or nun in official garb. The march followed a deliberate route to the front of City Hall, where the police would stop them and ask them to disband. Politely refusing to do so, the marchers would be arrested and taken to jail. This is how things always played out—without incident. But this time, with King in town, all bets were off. Rumors sprung up everywhere that card-carrying Communists, armed with weapons, had come pouring in town. The KKK responded by calling for a rally in Albany, declaring an “alert,” and asking its chapters to send “white militia” to Albany, prepared to fight. “Over my dead body!” another retorted. “Two, four, six, eight . . . we ain’t gonna integrate!” a group of teenagers methodically chanted, time and again. Sure enough, bringing up the rear were several rows of black women in their Sunday best, and right in the middle was our housekeeper of over 15 years, Hattie Jackson. In her 60s, Hattie was a proud, quiet woman. I was shocked. What did this mean . . . “our” Hattie in a protest march? The crowd moved at a quick pace on down Pine Avenue until they reached the area of City Hall, only to be met by a phalanx of big policemen in riot gear: tall black boots, white helmets, and black leather jackets. They chatted nervously among themselves, standing across the street about five feet apart, twirling their billy clubs. There was no reply, and the chief looked around nervously as a television camera crew pressed through the crowd with a micro­phone extended, trying to pick up the exchange. Chief Pritchett studied his watch . . . waiting for the two minutes to expire. Things were going according to plan. The marchers knew they would be stopped; the chief knew that they would not disperse; and the group expected to be herded into the area between City Hall and the jail, where they would be led one by one up the stairs to be booked and put in jail. The large crowd moved quietly into the area between the city jail and the courthouse, which were connected by a large brick building, thus surrounding the group on three sides. The policemen took their billy clubs, gently prodding and poking until all the demonstrators had squeezed into the small space. The marchers had started to sing again, but you could hear the voices of some starting to talk or complain out loud. One or two of the children began to cry. I was never sure what happened next . . . whether the demonstrators stumbled and tripped or were pushed to the ground by a nervous or overzealous cop. But people began to pile up in the narrow alley, and several ear-piercing screams penetrated the winter air. A couple of the onlookers laughed, and one man standing with us yelled out, “Looks like a bunch of niggers in a sardine can!” I saw the light-skinned young man and several others lock arms and circle King to protect him. Soon, the entire crowd had dropped to the ground, the singing had stopped completely, and screams and cries echoed out of the enclosed area. The white onlookers began to shout their approval, enjoying the discomfort of the protesters. I looked anxiously for Hattie but could not find her in the sea of black faces. It turned out that a young lady had fainted and was being passed above the crowd to the outside, where some medics could attend to her. “What about Hattie?” I asked. My father harbored no sympathy for the protesters and repeated the argument that the good local “colored folks” had been brainwashed by these “outside agitators.” But my father was a gentle man who would never harm another human being. I could tell that he was uncomfortable, even troubled, with what we had seen that day—the ugly mood of the crowd, the raw hate that we could see and hear and almost feel. Reading about the protesters in the local papers, I, too, felt threatened. These people were apparently out to destroy our way of life! But seeing it up close was entirely different, and witnessing the march that afternoon and seeing the faces of those people quietly fighting for their rights had an impact on me. I felt real shame for the first time in my life, standing by and merely watching while decent people—including our own dear Hattie—were herded into the alley and treated like animals. Later, I would mark that day as a moment of moral failure in my life. I had an opportunity to take a stand, to risk something—instead, I had just stood there. And like so many other “decent” white Southerners, I kept my outrage and my shame to myself. We worried that Hattie might be in jail. When she did not answer her phone, I begged my father to call the jail and check on her. We were surprised the next Monday morning when Hattie, who regularly rode the six o’clock bus across town to be at our house by seven, slipped quietly into the house, like always, wearing her crisp white maid’s uniform. She even gave me a good morning hug, something she used to do every day, but less often now that I was a teenager. Later, I would wonder if that hug was a way of forgiving all of us and Hattie’s way of bringing King’s message into our home: I love you even though you have mistreated me and my people. That hug, coming just two days after the march and Hattie’s arrest by the Albany Police Department, stuck with me the rest of the day. Hattie followed her usual routine: She took the garbage out; cleared off the dining table after breakfast; and assumed her usual place at the sink to wash the dishes before she went room to room, making up the beds and gathering clothes to be washed and ironed. My father appeared in the kitchen, dressed in a dark suit, ready to go to work. He looked surprised to find Hattie there, and I wondered what he would say . . . or if he would take her aside and scold her for getting involved in the march. “Good morning, Hattie,” he said. “Sure is, Mr. Jordan. Sure is.” Somehow I knew then that my father was confused by all that was happening and felt the same shame as I did. Something had changed, and none of us knew what to do or think about it! No one in our family ever said anything to Hattie about her marching, and she never mentioned it to us. She did seem to be spending more time at “church activities,” which was a clear signal to us that she continued to be heavily involved in the Albany Movement. It was through Hattie’s quiet commitment that I slowly began to appreciate the depth of the civil rights struggle. I was sure that all over the South there were “good colored folks” playing the same game as Hattie—working in the homes, restaurants, garages, and businesses of white people for meager wages but slowly and surely putting aside their fears to become the foot soldiers of the movement. A few years later, Hattie surprised my mother when she announced that she was taking the day off so that she could get people to the polls to vote in the 1964 presidential election. It was as close as she ever came to acknowledging her political activism to the Jordan family. 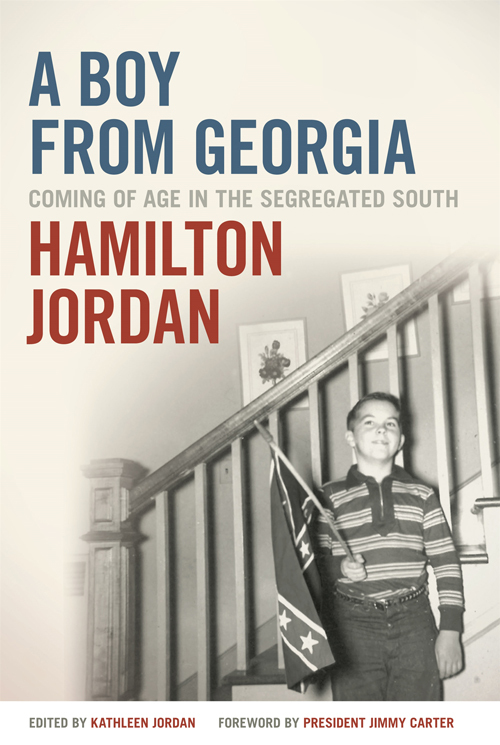 From A Boy from Georgia: Coming of Age in the Segregated South by Hamilton Jordan. Copyright 2015. Reprinted with permission from University of Georgia Press.